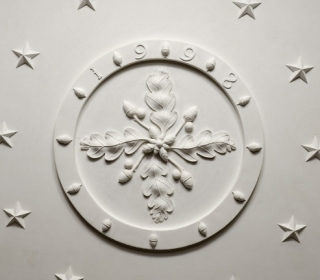 Welcome to the historic decorative plasterwork trail which guides you to examples of fine historic decorative plasterwork around Devon. The Sloping Deck Café forms part of the row of historical buildings called the Butterwalk in Dartmouth. Here you can see a beautifully preserved decorative plaster ceiling and a unique overmantel depicting the Pentecost with Moses on the left and King David on the right. This decorative plasterwork, as with the Tree of Jesse in the house next door, is believed to date back to 1635 when the Butterwalk was built. 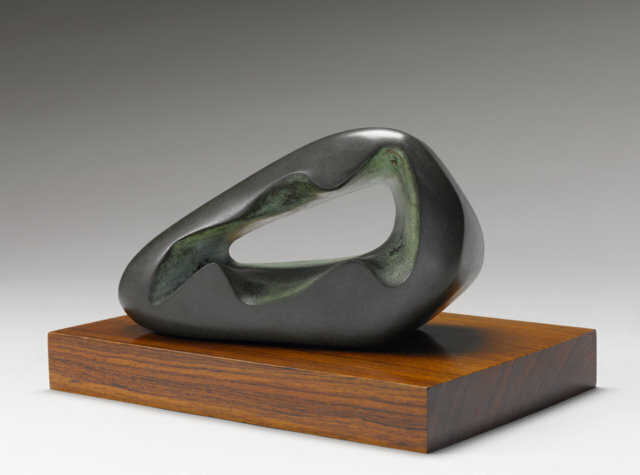 These days you can spend some time looking at this stunning craftsmanship over a cup of tea! There are about a dozen fine decorated plasterwork ceilings in the High Street in Totnes. Formerly the houses of rich merchants, the plasterwork ceilings would have been symbols of their wealth in their upstairs parlours, visible from the street below. As most of these ceilings are privately owned, it isn't possible to go inside the houses to see them. So why not view them from the street below at twilight? That is when the lights get switched on and the ceilings are beautifully illuminated. The Priory is part of Exeter City Council's museum service http://www.rammuseum.org.uk/ and you can find out more about opening times and admission to the Priory by visiting its web page http://www.rammuseum.org.uk/visiting-us/st-nicholas-priory . St Nicholas Priory dates back to around 1090, but its fine plasterwork ceiling was not made until the late 16th Century, when the Priory had changed use from a religious building to a Tudor town house, following the Dissolution of the monasteries under the reign of King Henry VIII. 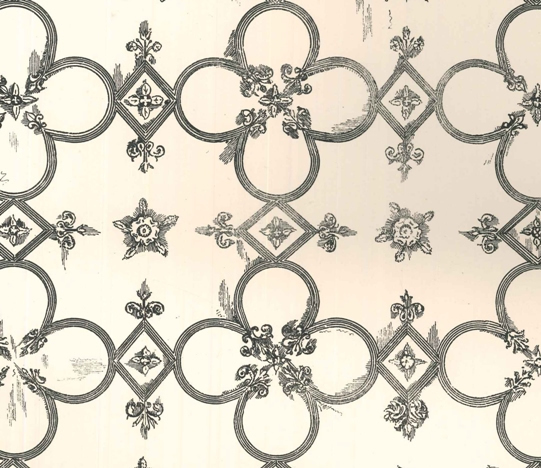 The ceiling is found in what was the parlour of the Tudor House and it follows a geometric pattern incorporating quatrefoils, lozenges and Tudor roses. In the lobby area by the stairs, the plaster design also incorporates the initials of William and Mary Hurst, who lived in the house in the 1580s. 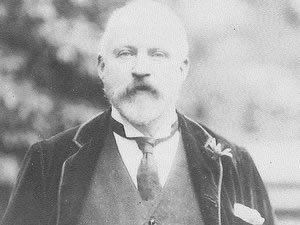 William Hurst was the grandson of Exeter's famous citizen, also called William Hurst, who had been mayor of Exeter five times. 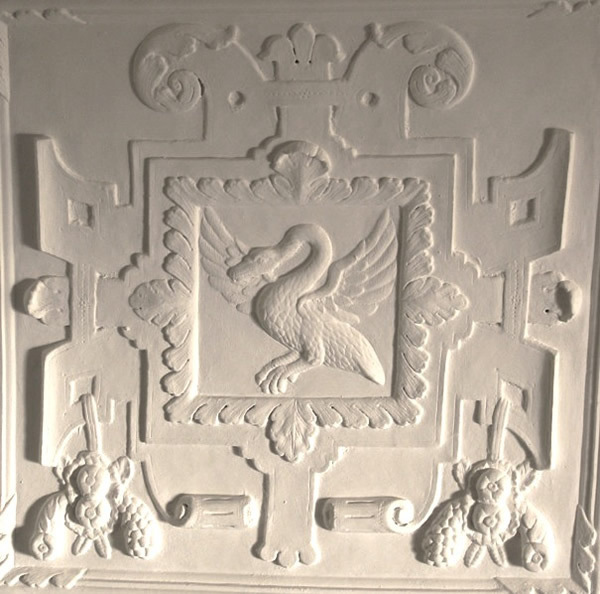 In the Parlour is also found a decorative plaster overmantel, which is not original to the building, but was installed there in a recent refurbishment, having originated from 229 High Street, Exeter. The white paint on this overmantel disguises the fact that it was originally painted in bright colours. Whilst visiting the Priory, look out also for the Tudor rose moulded plaster designs in the upstairs chamber. 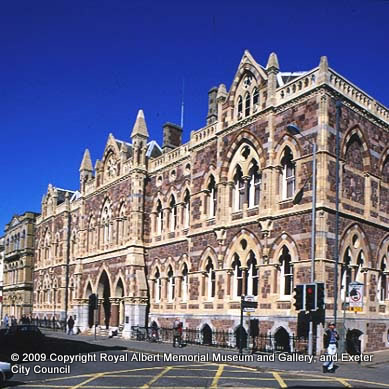 After the Civil War, there was a boom in trade in Exeter, which was famous for the woollen cloth it exported and the Exeter Chamber (the City Council of the day) commissioned the building of the Custom House in 1680-1. 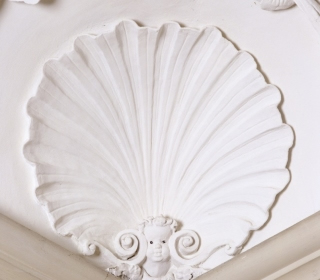 One of the finest features of the Custom House is its series of decorated plaster ceilings in the first floor rooms. 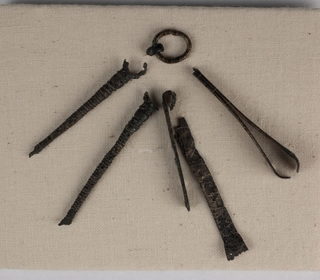 Records show that these were made by John Abbott of Frithelstock, a village in North Devon. John Abbott is remembered through his remarkable pattern book, which was passed down through generations of his family and now kept at the Devon Record Office. Most of the decorative plasterwork is hand-modeled (stucco) and features beautiful flowers, grapes, oak leaves, cherubs and even writhing eels, framed by ribbed plaster mouldings. 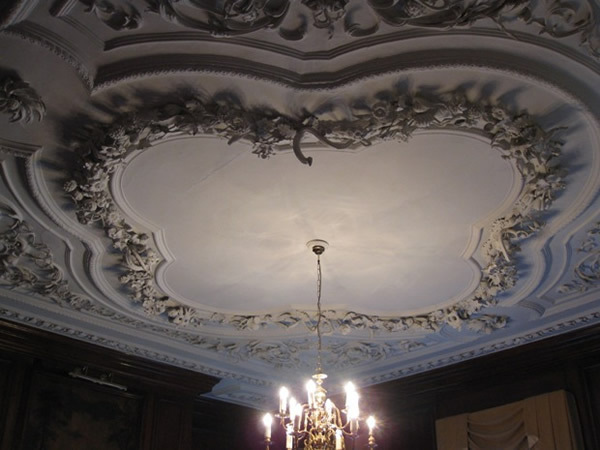 These ornate plasterwork ceilings really show off the skill and creativity of the plasterer and are truly breathtaking. 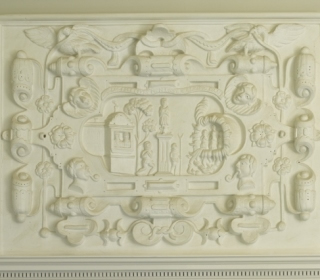 The Museum of Barnstaple & North Devon houses a fine plasterwork overmantel created by the North Devon School of Plasterers. 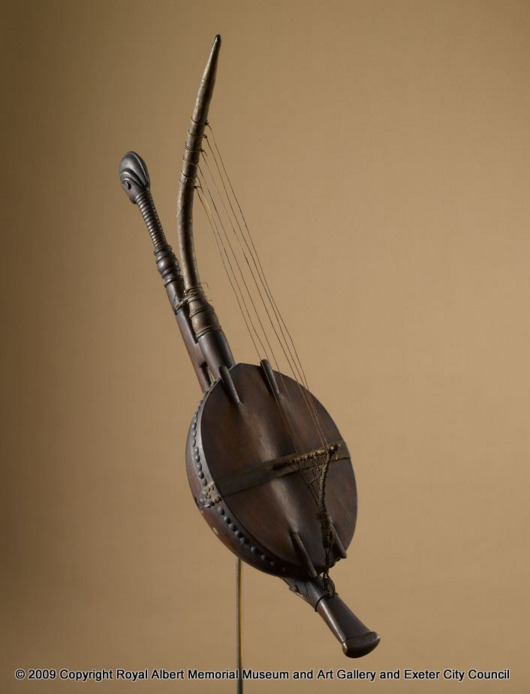 It is believed to date to circa 1620. It depicts the Annunciation. 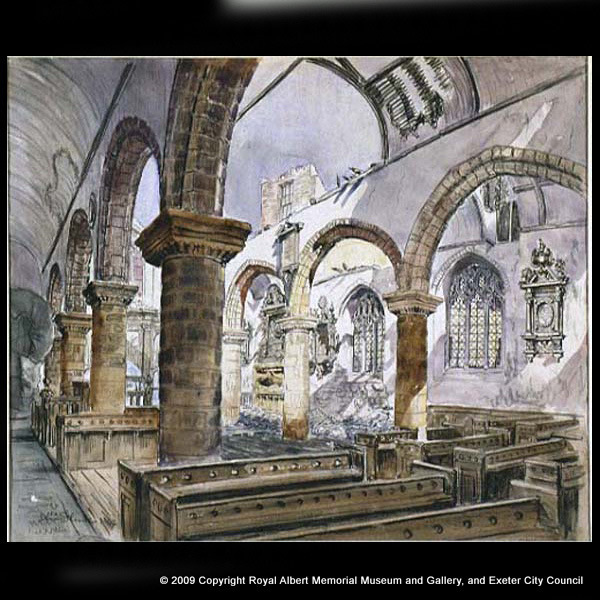 It could possibly have been created by a forbear of John Abbott, the only identified individual Devon plaster worker, as it is sketched in his pattern book (held in the Devon Record Office) which dates to 1662. This particular overmantel comes from 69 High Street, Barnstaple, North Devon. (It may have originated in Dunster Castle, Somerset, being transferred to this address in Barnstaple sometime later.) It was removed some time between 1957, when it was listed by Kathleen and Cecil French in an article in the Transactions of the Devonshire Association, and 1964, when the building was demolished. Originally situated in one of the two first floor bedrooms, which also had decorated early 17th century ceilings in the single rib style. Overmantels were not necessarily contemporary with the ceilings in the same room. A special feature of the overmantels of this period was the Biblical or allegorical scene. 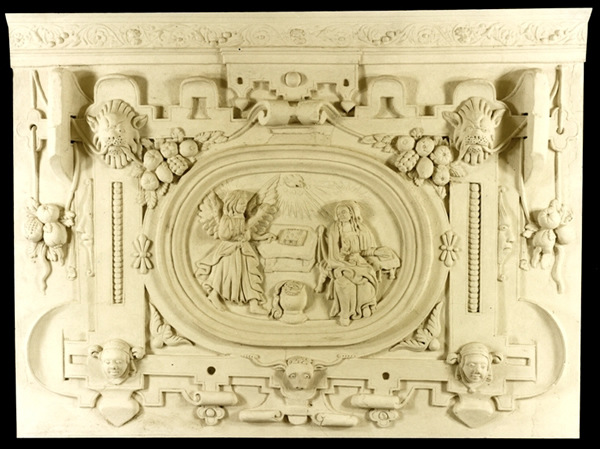 This early 17th century plaster overmantel is set in an elaborate Mannerist cartouche in the style of Vredeman de Vries, depicting the Annunciation in an oval panel. Above the central figures of the Virgin Mary and the angel Gabriel is a dove emerging from a sunburst. A Jacobean type alter table with fringed altar cloth and square legs carries a Bible. A frieze along the top displays a running vine of grapes outerlinked with flowers. Stylistic lion's heads appear on the upper right and left, whilst stylised heads of a 'court jester' feature on the lower left and right. A ram's head with twisted horns is featured at the base of the central panel. Decoration is in the form of pomegranates, apples, lemons, grapes, oranges and peaches in strap-work interlacing along with oak leaves. The surround also features grotesque heads. The structure is made of modelled and moulded plaster, mounted on a backing of cob and lime plaster, on a framework of oak on hazel laths with cross battens of oak. Dimensions: width 6ft. 2ins, height 4ft. 11ins. This overmantel was purchased with help from the National Art Collections Fund, the Museum and Galleries Commission/Victoria and Albert Museum Purchase Grant Fund and Barnstaple Town Council. 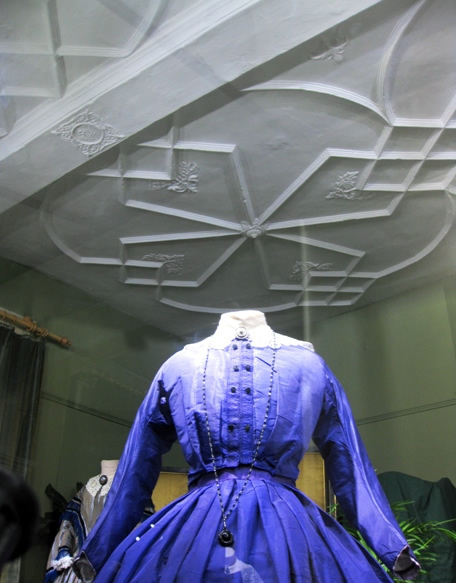 Totnes Museum of Fashion and Textiles is open from Spring Bank holiday to 1st October - Monday to Friday 11.00am to 5.00pm. 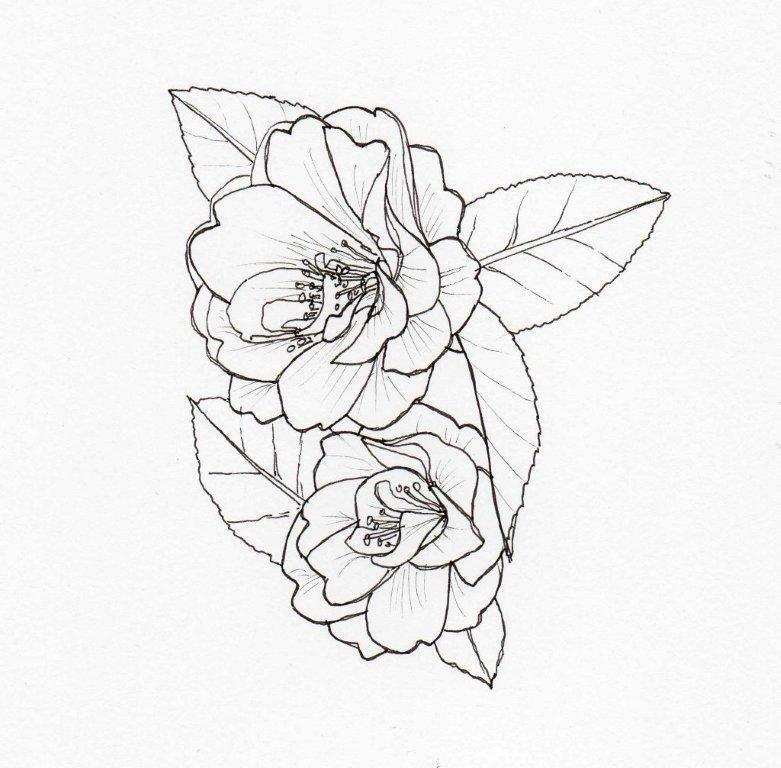 May and October by appointment. There is an admission charge. The decorative ceiling on the first floor is a geometric pattern of plaster ribs, in lozenge and quatrefoil designs and also featuring Tudor rose and fleur de lys mouldings. Incorporated into the design are the initials 'EB' and 'WB' - probably referring to the owners, William Bogan, who was mayor of Totnes in 1580 and his wife Elizabeth. This ceiling has a similar feel to the ceiling in the parlour of St Nicholas Priory in Exeter, which dates to the same period. Perhaps both ceilings reflected the plasterwork fashions of the time. Bogan House also boasts a lovely plaster ceiling on the ground floor, which incorporates various flowers in the design, including the then highly-prized tulip. This room is not always open to the public when the Museum is open. Visit Powderham Castle website http://www.powderham.co.uk/ for visiting times and admission prices. The staircase at Powderham Castle has been described as 'among the half-dozen or so most sumptuous surviving examples of rococo plasterwork in England'. It features stunning stucco animals, birds, flowers, fruits and birds, set against a blue/green background. 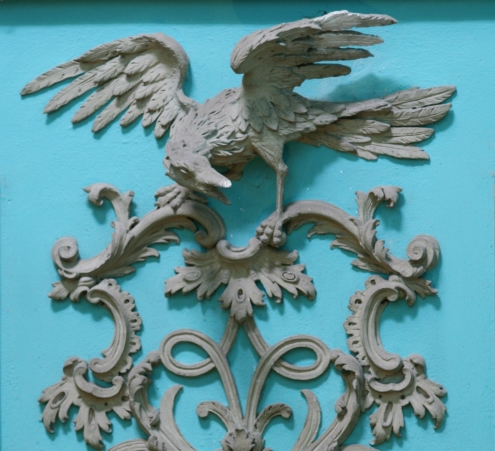 Dating to the mid 18th century, the style of this plasterwork is significantly different from that found in Devon merchants' houses of the 17th century. It is principally hand-made stucco, rather than being moulded. It was made in the Rococo style, a type of design which was popular in France in the 1730s and then spread throughout Europe. Records show that the principal plasterer working on this piece was John Jenkins. Opening times: Tuesday to Sunday, 10am to 5pm. Closed Mondays and bank holidays. 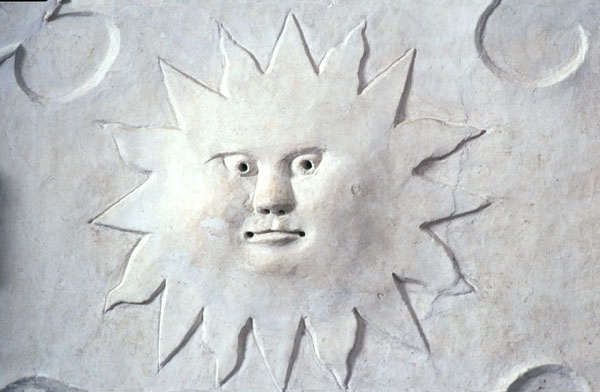 On display in RAMM's Making History Gallery is a wonderful plaster sun overmantel, originating from Great Moor House, a large farmhouse which once stood where Sowton Industrial Estate now is. Unfortunately the house was destroyed by fire in the 1980s. The plasterwork is believed to date to the late 17th century, although the original house was much older. You can see a small replica of this overmantel in the foyer of the replacement Great Moor House, home to the Devon Record Office and Devon Library Service HQ. 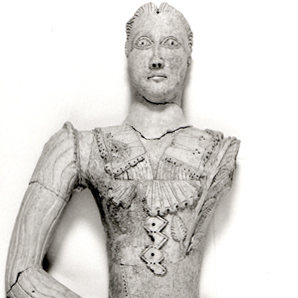 On display in RAMM's Making History Gallery is the Berry Pomeroy caryatid. (A caryatid is a supporting column sculptured in the form of a draped female figure.) 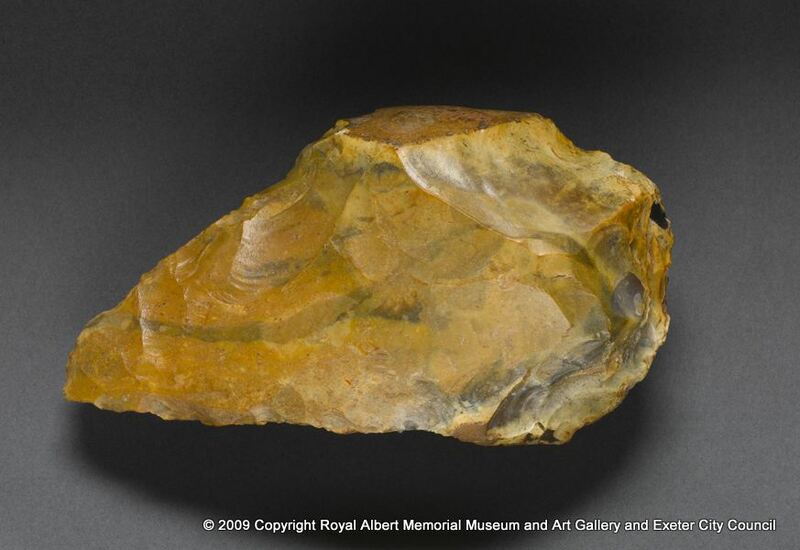 It was excavated in 1980-81 from the Great Hall at Berry Pomeroy Castle, near Totnes. At about 1.44 m high, she is one of two caryatids excavated, which possibly flanked a grand overmantel. On her left side you can see what appears to be a branch of laurel which would have been held in her left hand - perhaps a symbol of peace or victory. From what is left of her hairstyle, it appears to be based on an Italian hair fashion from about 1600 - 1605, with a central parting from which the hair is combed upwards and then falls in wavy tresses. 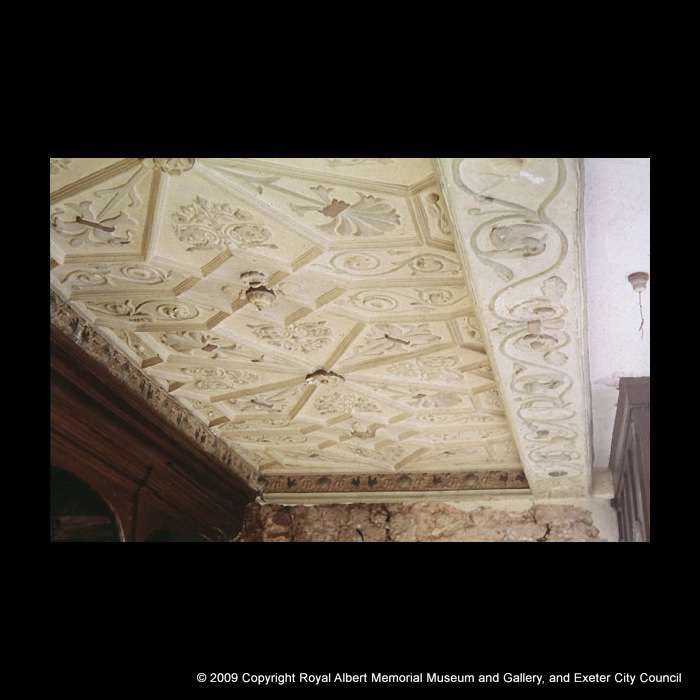 In the Museum's Making History gallery you can see the decorated plasterwork ceiling from the now-demolished Half Moon Inn which once stood in Exeter's high street in its full glory - a profusion of flowers in an oval border. This ceiling probably dates from the 1680s when the Half Moon Inn was built. How was this ceiling made? First rows of close-set laths were nailed to the floor joists above. Then a thick backing layer of cob plaster containing much horse- or cow-hair was squeezed between the laths. A second layer of plaster and finely chopped animal hair was then applied, followed by a finishing coat of pure white lime plaster in which the detail was modeled and cast. The decorative flowers in the design are mounted on armatures of wood, to bring them into high relief. Each flower would have been made separately and then stuck into the ceiling, gradually building up the design. Like the Custom House Long Room ceiling, the design unusually includes a plaster eel. Opening times: Wednesday to Sunday, 10:00 - 5:00 (last admission 4:00). Closed Mondays and Tuesdays. Admission prices vary, please telephone 01803 293593; email torreabbeyenquiries@torbay.gov.uk or visit Torre Abbey website http://www.torre-abbey.org.uk for details. In 1598, Lord Seymour sold Torre Abbey to Thomas Ridgeway, a wealthy young lawyer who was to become one of the most important administrators and politicians in England and Ireland. Ridgeway bought Torre Abbey to convert it into a grand home for himself, his wife, and their growing family. As part of his conversion scheme he decorated the living rooms on the first floor of the south range with fashionable moulded plaster friezes. 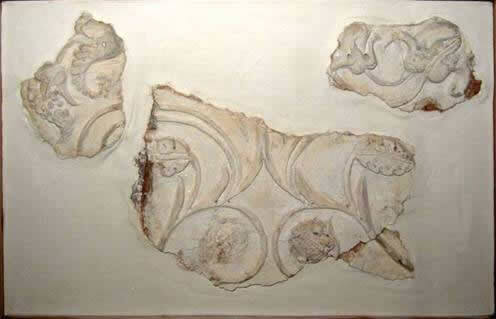 Although no longer in situ, you can see some framed fragments of the friezes on display at Torre Abbey. 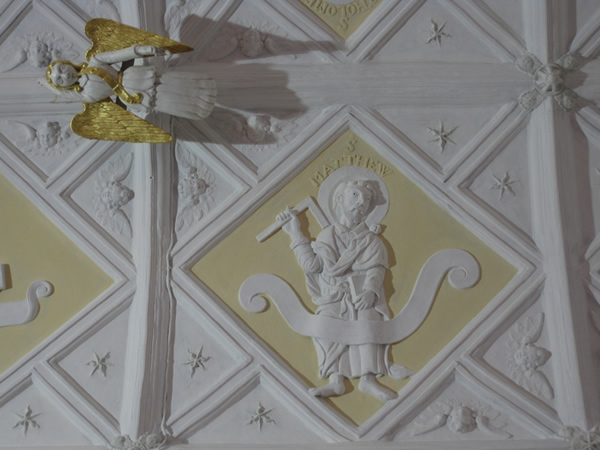 <p>A fine example of modern decorative plasterwork is also to be found at Buckland Abbey, in the Drake Chamber. The ceiling in this room was specially commissioned by the National Trust. It was designed in the Devon tradition by Jane Schofield in 1998 and hand-modelled in situ by Kervaig Associates, using lime plaster. Designs for this ceiling are based around the history of the Abbey - including anchors and rope, bees and beekeeping and also an oakleaf design, resonating with the National Trust logo. The Lady Chapel or Peamore Chapel in St Martin's Church, Exminster is so-called because of its association with Peamore House and the Tothill and Kekewich families. Its barrel-vaulted ceiling was installed courtesy of the Tothill family and is dated 1633. The stunning plasterwork designs found in this Chapel form a representation of Heaven. There are angels, demons and stars. The four panels nearest the screen show the four evangelists, each with his emblem: Matthew with the god angel, the Divine Man; Mark the winged lion, to show the royal dignity of Christ; Luke, the winged ox, representing sacrifice; John, the rising eagle, symbolising the mysteries of Heaven. The other twelve panels feature the Apostles - notice Matthias in place of Judas Iscariot. <p>The ceiling was obscured for many years by coats of distemper and it was not until 1964, while it was being cleaned by a local builder, that the wonderful plaster designs were revealed once more and the ceiling restored to its present state. Believed to date back to 1635, the plasterwork ceiling is found in the King's Room, a panelled room where King Charles II is said to have dined in 1671. The decorative plasterwork follows a geometric design with a single plaster rib pattern and features cherubs and plant forms. The Tree of Jesse is not in the main part of the Museum and viewing is by appointment only by telephoning giving at least 48 hours' notice. 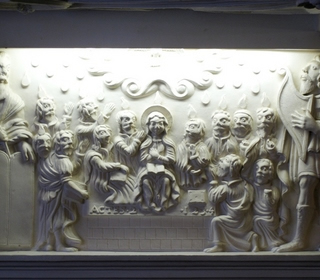 Believed to date back to 1635, this is thought to be the only surviving plasterwork depiction of the Tree of Jesse. 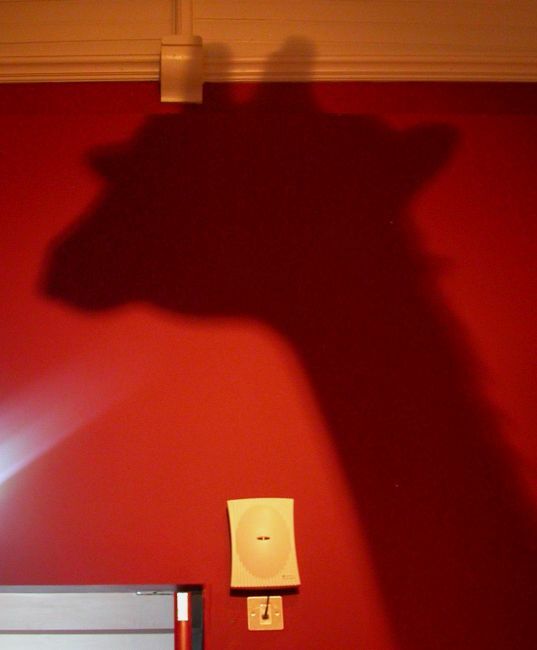 It can be found in the first-floor parlour of a former merchant's house in the centre of Dartmouth. In the Bible, Jesse was the father of David and the tree shows all his descendants, up to the birth of Jesus. At the foot of the design you can see Jesse lying down with a vine rising from his body with generations of the House of Jesse above him, with Mary holding the baby Jesus at the top. In the four corners of the design are the four writers of the Gospels, Matthew, Mark, Luke and John, with their traditional symbols - Matthew with a man, Mark with a Lion, Luke with an ox and John with an eagle. Old Forde House is not normally open to the public. However, it holds special open days during Summer months. Please check the Old Forde House website for information: href="http://www.teignbridge.gov.uk/ofh/"
The old part of Forde House is believed to date back to around 1545, when it was acquired by a John Gaverock as part of the Wolborough Manor. When he became Lord of the Manor. The later main part of the building was built in 1610 by the next owner, Richard Reynell, who was a lawyer and officer in the Court of the Exchequer. 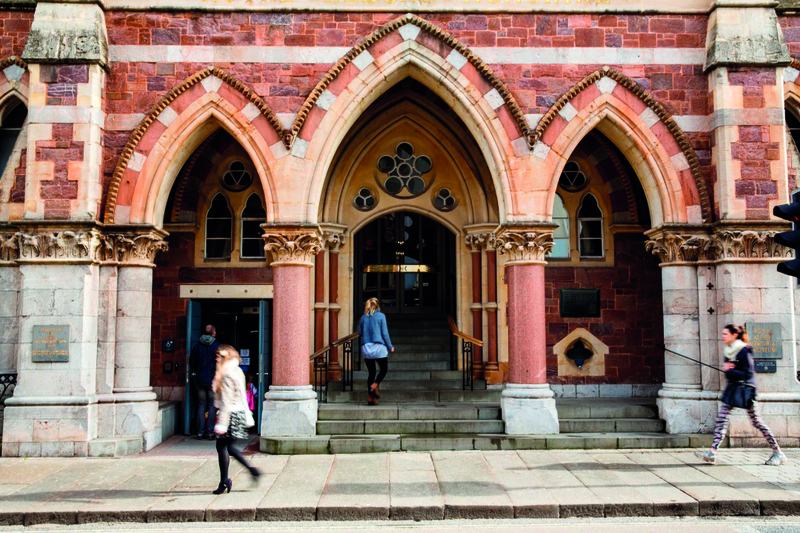 Forde House in Newton Abbot boasts many beautiful architectural features including a fine array of 17th century decorative plasterwork designs. It is believed that some of the designs were made in readiness for a visit from Charles I and date to 1625. There are a wealth of many different decorations in many of the rooms, including stylised and mythical creatures such as Pegasus, a mermaid with her mirror and a basilisk (a cockerel with the tail of a serpent), as well as animals and birds, including a swan, a fox and dolphins. One of the most stunning rooms is the Long Room with its barrel-vaulted decorative plaster ceiling. 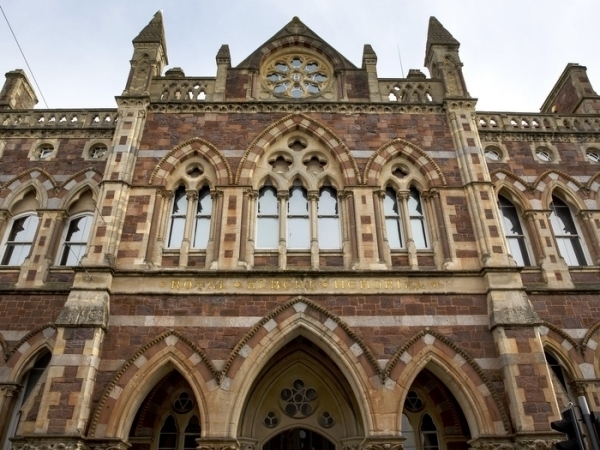 It is one of the best surviving Great Chambers of its period in the West Country. 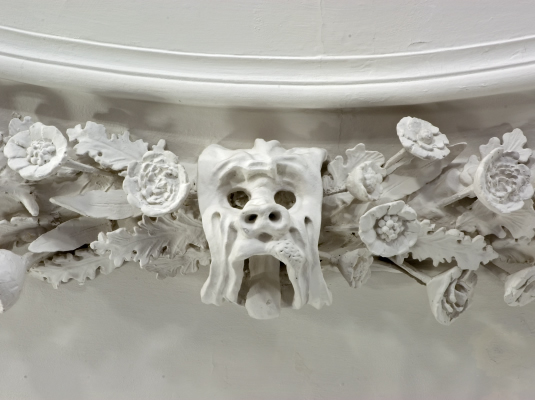 Plasterwork creatures are set within decorated plaster ribs in geometric patterns. Also in this room, can be seen examples of strapwork cartouches. 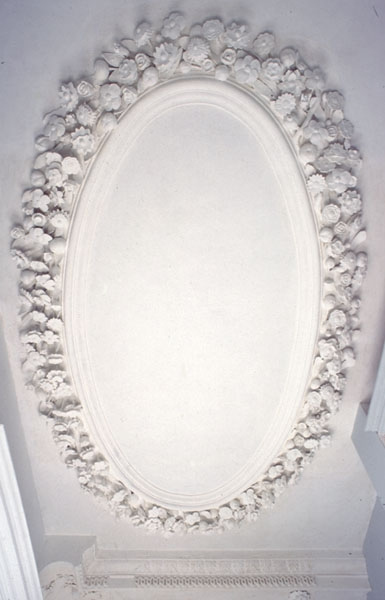 These are plasterwork 'frames' with scrolled edges which were also used to surround special designs and friezes. The fashion for strapwork cartouches is believed to have originated from the pattern books of Dutch architect Hans Vredeman de Vries, who published his designs in the second half of the 16th century. Inside this cafe/restaurant is one of the most stunning examples of historic plaster ornamentation in Devon. This building was originally created for the Guild of Spanish Merchants in 1620. On the barrel-vaulted ceiling, a geometric design of plaster ribs and strapwork make frames for hand-crafted birds and animals crammed into every space, as well as biblical scenes. The design includes elephants with strange hind legs - the plasterer had clearly never seen a real elephant! You can enjoy gazing at this profusion of plasterwork over a cup of coffee! This ceiling features a single-ribbed geometric plaster pattern, in four kidney shapes which provide a frame for cast tudor roses and floral sprigs. In the centre of the design is a panel showing the Barnstaple Town Arms on a shield. The design of the shield is influenced by the Flemish style which had recently become fashionable. The ceiling probably dates to the late 16th century. Barnstaple was a major seaport in Elizabethan times and merchants there could clearly afford to decorate their homes and businesses with beautiful ornamental plasterwork. 8 Cross Street is now a menswear shop but visitors are welcome to go in to view the historic plasterwork there. Downes House was originally built by a prosperous Exeter merchant called Moses Gould. The construction was believed to have taken place between 1692 and about 1700. Since then the house has passed through the family to the Bullers (of whom the famous Victorian, General Redvers Buller was part) and more recently to the Parker family. 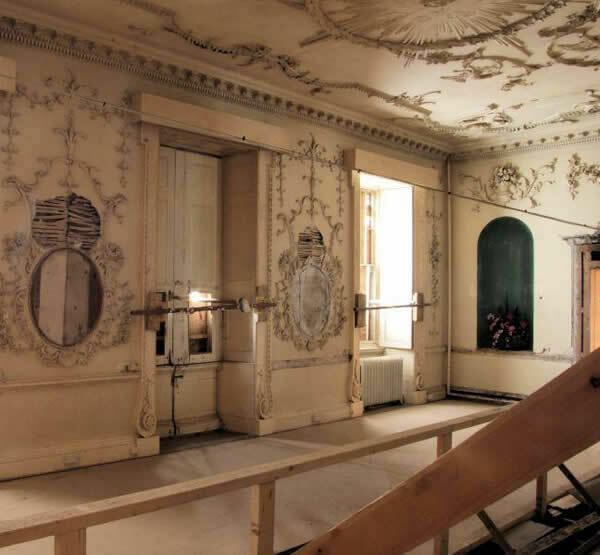 Throughout its life the house has had many makeovers as architectural fashions changed through the centuries, but it has retained what was probably one of its original features, the decorated plasterwork ceiling above the main stairwell. This ceiling is typical of the late 17th century Devon style. A recent study of the mouldings and patterns in this ceiling has concluded that it may have been made by John Abbott (who was responsible for the ornamental plaster ceiling in Exeter's Custom House in 1681). It features swags of fruit and flowers, acanthus leaves and cherubs all in high relief and is very striking, set against a dark brown background. The design includes Coats of Arms including those of James Buller and Elizabeth Gould perhaps as a later addition. Greenway was the private holiday home of the famous crime writer Agatha Christie and her family. 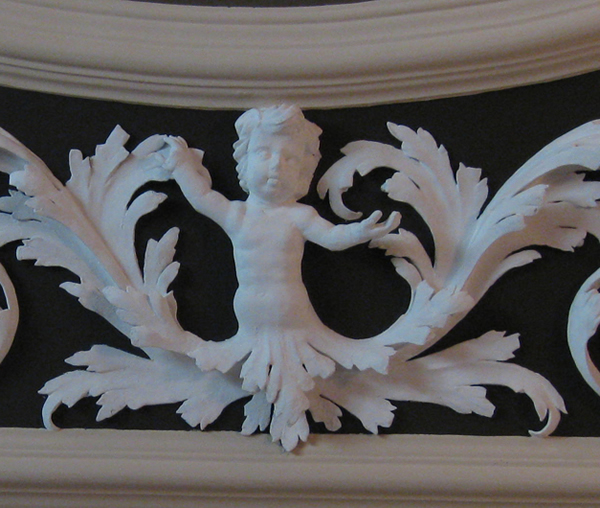 This plasterwork overmantel is situated in the Winter Dining Room at Greenway. It is believed to come from an earlier house on the site, Greenway Court. King Nebuchadnezzar set up a huge gold image which he made people worship. If they refused, they would be thrown into the fiery furnace. Shadrach, Meshach and Abed-nego who were Jews from Babylon refused to worship the image and the King ordered them to be thrown into the furnace which had heated up to seven times its normal heat. However the fire didn't have any effect on them. King Nebuchadnezzar says, 'Lo, I see four men loose, walking in the midst of the fire, and they have no hurt; and the form of the fourth is like the Son of God'. Henceforth their God had the respect of King Nebuchadnezzar! Above the characters is a scroll with the inscription, Said Loe I see Foure Men Loose Walking Dan 3. Around the central panel is a strapwork frame containing a number of applied moulded motifs: winged cherubs, heads to the upper right and left; male heads with long curled tongues pointing out, Tudor roses, birds and geometric decoration. The overmantel is believed to date to the early 17th Century. Bradley Manor was built in the 13th century and extended in the late 15th century.The Manor has many beautiful architectural features. In one of the bedrooms can be seen a rich late 17th century ornamental plasterwork cornice decoration. The high-relief plaster ornamentation in this room includes swags of fruit and flowers. In the corners are plaster shells, two containing a cherubs' heads and two the faces of little leafy demons or 'green men'. This plasterwork may be that of John Abbott, who was responsible for the ornamental plaster ceilings in the Custom House, Exeter. Another of the upstairs rooms in the south-east corner contains a wonderful early 17th century plaster armorial overmantel. Gilbert Yarde, the owner of Bradley Manor at the time married Judith Hele in 1595 and they had this overmantel made for the room which they occupied. 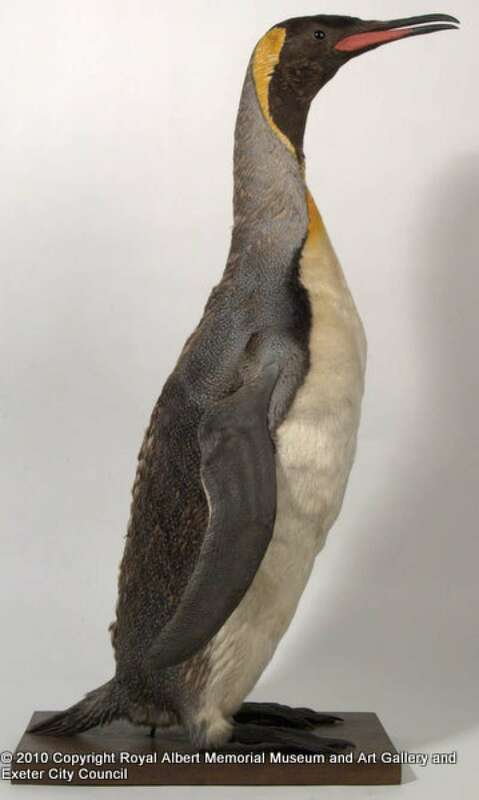 It features the coat of arms of the Yarde and Hele families - the Yarde crest, a swan rising from a coronet with a horseshoe in its beak and the Hele crest, a falcon with its wings raised. Heraldic antelopes support a shield and below them is the motto Ignis Corpus Spiritus Animam (As fire is to the body, the spirit is to the soul). Saltram was originally a Tudor House, but was much embellished during the 1700s by the Parker family who lived there from 1712 until it was passed to the National Trust in 1951. The first changes to be made were in the 1740s, giving the house Palladian facades and beautiful Rococo ceilings in the Entrance Hall and Morning room. The Entrance Hall plaster decoration features a large figure of Mercury, god of good fortune, to welcome visitors. Four plaster panels over the doorways represent the four elements (fire, air, water and earth). The Morning Room ceiling is on a musical theme. The most significant plasterwork in the House is to be found in the Saloon. The interior design, from carpets to ceilings, was carried out by Robert Adam in 1768. Adam's designs were based on the design and proportions of classical buildings of Rome. His original drawings for the Saloon were modified to reflect the taste of the owner at the time. 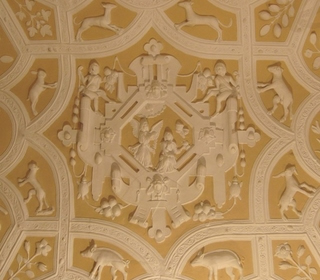 The ceiling you see today is a bold pattern of three plasterwork ovals, each containing paintings of hunting scenes. On the borders of the ceiling you can see acanthus leaves and sphinxes. 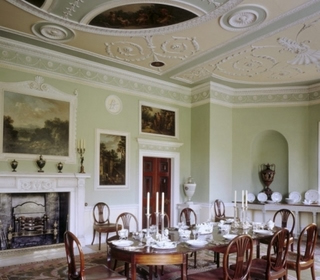 A second room designed by Robert Adam is the Dining Room. Originally designed as a library in 1768, it was changed to a dining room about 10 years later. It still features the delicately decorated plasterwork Adam ceiling, incorporating four paintings on classical themes by Antonio Zucchi. The Frithelstock Churchwardens' accounts for 1676 include the following entry, "Pd. John Abbott for making of the King's Arms and writing in the church and playsteringe of the Church and porch..£13.06.08". 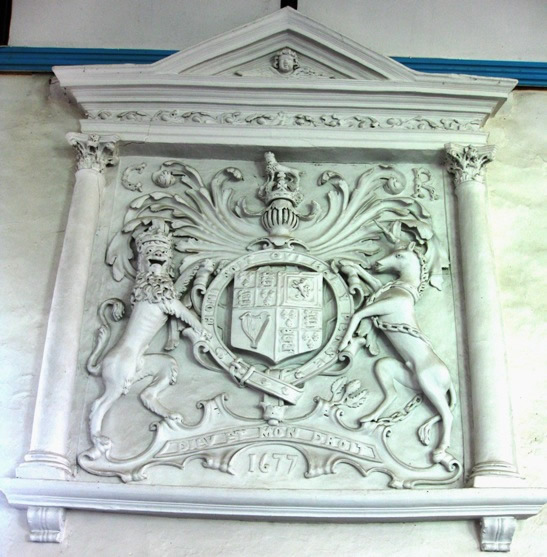 John Abbott must have been commissioned to make this fine coat of arms in plaster to mark the restoration of the Monarchy. Dated 1677, this substantial plasterwork panel is one of the principal decorative elements inside the small country church at Frithelstock. This is one of a series of fragments of plasterwork from Burrell Farm, near Saltash, Cornwall. 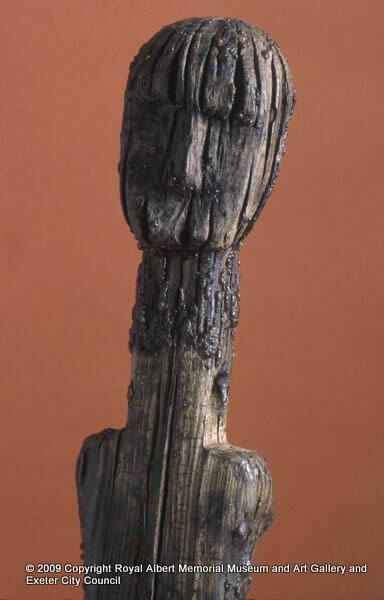 Dating between around 1600-1700 it would have formed part of a dramatic wall and cornice decoration. 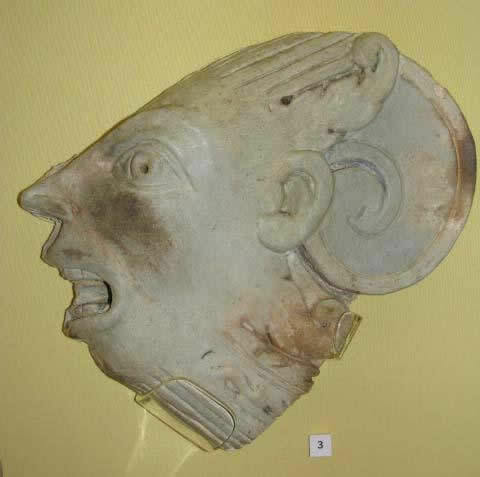 It is on display along with other examples of plasterwork in the 'Uncovered' Gallery at Plymouth Museum and Art Gallery. Viewing the plasterwork is strictly by prior appointment only. Part of the The Royal Hotel in Bideford is made up from a former town house built in 1688 by John Davie, a wealthy merchant. 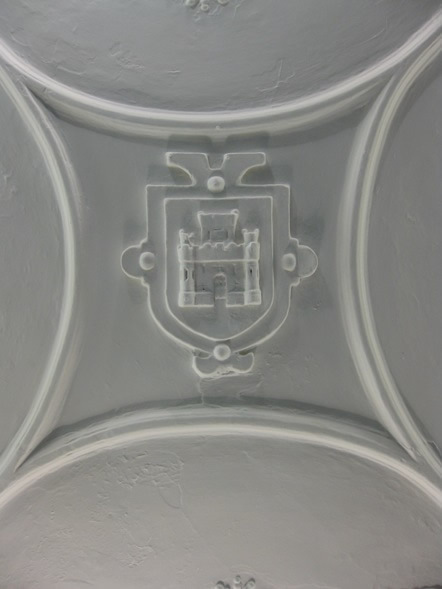 Two ceilings on the first floor of this part of the building are decorated with high relief plasterwork. The most ornate ceiling is in the Kingsley Room, with a central stylised quatrefoil wreath, made from leaves, exotic fruit, eels and grotesque masks. 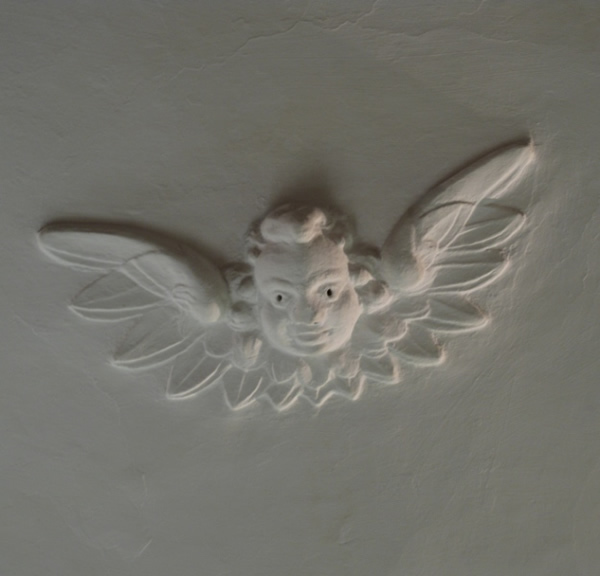 In each corner of the ceiling are spandrels decorated with plaster putti and acanthus leaves. 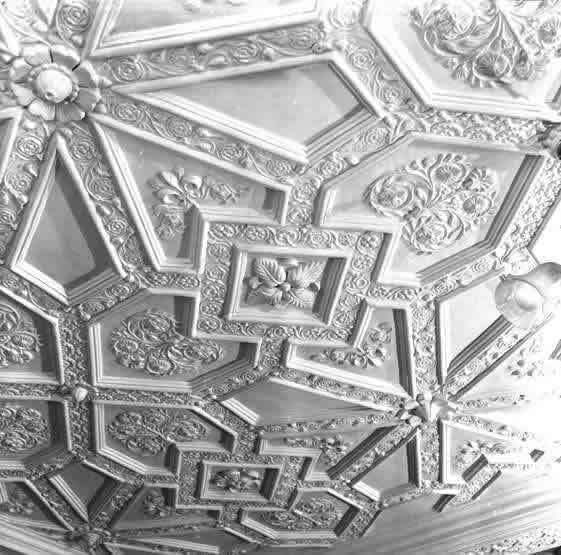 A recent study of the ceiling has found that it is likely to have been the work of the Devon plaster craftsman, John Abbott, who also made the decorated plaster ceiling in the Custom House, Exeter in 1681. Extensive renovations are being carried out at Poltimore House. Please visit the Poltimore House website http://www.poltimore.org/ to check when it is next open or to make contact with the trustees. Poltimore House dates to the second half of the 16th century and extensive alterations were made to it in the 17th and 18th centuries. In the 20th century the house passed through several owners and was in turn a school and a hospital. Since the 1970s the house has fallen into disrepair and many of its grand features have been removed. However, one feature which still remains is the impressive stucco decoration in the room known as The Saloon. This plasterwork dates to the mid 18th century. Here you can see ornate baskets of fruit and flowers, leaves and cherubs' heads. If you look at the ceiling, you will see a slightly different style of plasterwork featuring the head of Apollo with rays of light emanating from it, herons and clouds. Whilst the ceiling designs are in low-relief, the high relief swags and garlands of fruit and flowers on the walls resemble the style of plasterwork at nearby Powderham Castle. All of them accessible to the public but do check opening hours before visiting. Copyright (c) 2019 Historic Decorative Plasterwork in Devon. 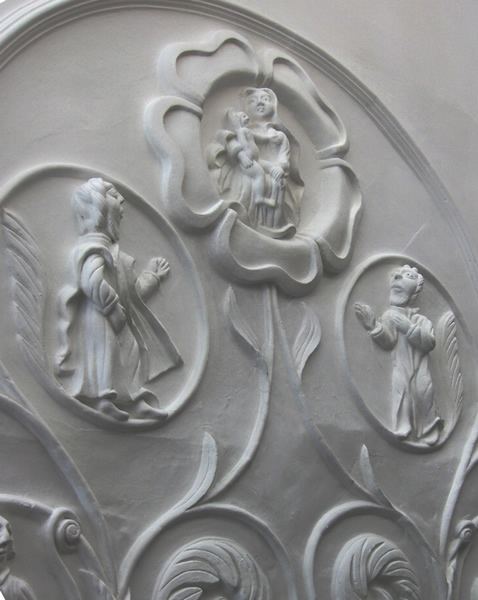 This website is licensed and operated by Historic Decorative Plasterwork in Devon.